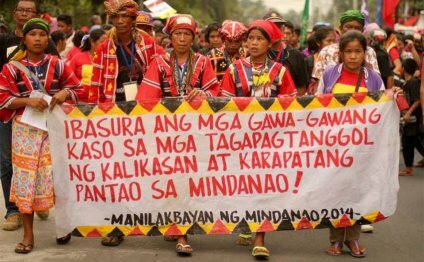 MANILA: Hundreds of indigenous people from the southern Philippine island of Mindanao gathered in Manila on Monday (Oct 26) for the beginning of a week-long protest and awareness campaign. Known as the Lumad people, they are demanding the demilitarisation of their ancestral homelands. Datu Kaylo Bontolan, a member of the Manobo tribe from Mindanao has been living in an evacuation centre for five months with his family and hundreds of other tribal members. The centre is hot, cramped and far away from his workplace. But he felt that he had to leave his ancestral land, following a spate of killings of fellow tribesmen and a continued militarisation of the area. Mr Bontolan is a Lumad, the collective name for the 18 tribes of indigenous people living in Mindanao. He is part of a convoy of about 800 protesters, dubbed Manilakbayan, who have travelled to Manila to protest against their situation. Over the next week, they will hold a series of marches, talks and activities to raise awareness on their plight. The Lumads, located in the resource-rich areas of Mindanao, have been fighting a constant battle over the resources of their ancestral lands. The area is heavily militarised because of threats from rebel groups and extremist organisations, and often, it is the Lumad who are caught in the middle. There have also been a number of reported killings of tribal members, including one advocate who was active in protesting against alleged rights violations, mining and land conversions in ancestral lands. From March to October this year, the United Nations documented the murders of 14 Lumad leaders, activists and villagers, including children. Attacks on tribal schools and teachers have also been reported. Kerlan Fanagel, a spokesperson of Kalumaran Mindanao, Davao, said: “We want the government to pull out all the armed forces of the Philippines who have encamped in our community, in our schools and houses, and who want to systematically grab our ancestral domains." The protests of the Lumad have slowly gained national and international attention, with various members of the Philippine government speaking out against the killings. The United Nations has also demanded an investigation. In the last of the series, Simon Reeve leads a team of journalists on a journey of discovery in the Philippines, from the staggering scenery of the mountainous rice terraces in the north, to the war-torn Muslim regions of the south.